1. A capella: The Italian phrase, literally “in chapel style” but meaning “without instrumental accompaniment,” is two words. 2. Apropos: The French phrase for “to the purpose,” and meaning “with regard to” or “opportune” or timely,” is treated as two words in the original language but as one in English. It’s sometimes erroneously split into two in English, which is not appropriate. 3. Capisce: This formal Italian term meaning “understand” is employed in English as a slang interrogative equivalent to “You know what I mean?” (Notice that capisci is also correct, as it’s the equivalent of capisce in the second person). 5. Coffee klatch: This half-translation of the German word Kaffeeklatsch (“coffee gossip”) is an open compound (or, in a variant, more faithful spelling, a hyphenated compound: coffee-klatsch). 6. De rigueur: This French word for “proper,” adopted into English, is (like liqueur) properly spelled with two us. 7. En masse: This French phrase for “as one” is one of several adopted into English as is. 8. Flak: This German acronym — derived from Fliegerabwehrkanonen, or antiaircraft guns, and, by extension, the shells fired from them, and used in English to refer to criticism or opposition — has so often been misspelled flack that this second spelling is now an accepted variant, though the direct borrowing is preferred. 9. 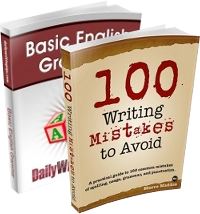 Hors d’oeuvres: The jumble of vowels following the article d’ in this direct borrowing from the French phrase meaning “apart from the main work” stymies many writers. 10. Laissez-faire: This direct translation of the French phrase translated roughly as “let do” and referring to minimal government interference in economic or other affairs is always hyphenated, even when used as a noun. 11. Mano a mano: This Spanish phrase for “hand to hand” refers, in English as well, to two people going up against each other in competition or conflict. 12. Oeuvre: The French term for “work,” most often used in the sense of the sum total of an artist’s output, consists of a bewildering sequence of letters. 13. Per se: People unfamiliar with the origin of this phrase (it’s borrowed directly from the Latin phrase meaning “in itself”) sometimes misspell it “per say” (perhaps as if to write “as said”). 15. Tchotchke: This improbably spelled alteration of a Yiddish word meaning “trinket” is a spelling bee competitor’s nightmare. Regarding the origin of the word “segue”: nothing French there. It’s an Italian word. How come it’s ‘appropriate’ to keep two words for ‘a capella’ but not for ‘a propos’?!? on today’s topic. foreign phrases. But … but … how is Fliegerabwehrkanonen pronounced? I’d love to use it in a sentence! @Deborah H: I think you’ll find it is “flee-ger-ahb-verk-ahn-oh-nen” with the emphasis on the “ahb” sound with a lesser emphasis on the “oh”. Okay, the freakiness has gone too far! 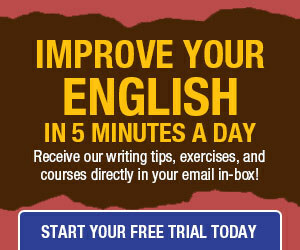 I receive these tips through my email, but it just seems that whenever I’m wondering about a certain grammar topic, I log into my email and there’s the answer…just waiting for me…from this site. It’s getting weird, but a good kind of weird. These are great tips, and always helpful…especially to me, but I think whoever is sending out those emails might have some freaky mind-reading talent or something. Keep it up. She rolled her eyes and corrected it with ‘voilà’. a cappella NOT a capella is the correct spelling. I’d argue that using the correct pronunciation of chaise longue will make one sound like a twit. It’s no longer French – it’s American English. Pronunciations that get on my nerves? Salade nicoise, with “niece wah” tripped off the tongue by waiters and patrons alike, instead of the proper “niece wahz.” The e on the end is the feminine form and the s is pronounced (like a z). This holds true for the feminine of Francois, which is Francoise. “Croysont” is like fingernails on a blackboard, but on this side of the Atlantic, it seems no one can say crwah-sohn, which still isn’t quite right, but a lot closer. I have no problem with “arm war” for armoire. And Paul, the v in voila is pronounced — it’s “vwa la.” Don’t listen to the dorky news people; they don’t know what they’re saying. I question if the correct pronunciation is divided as ‘verk- ahn’, but rather ‘ver-kahn which would make the last word sound more like cannon, An anti-aircraft gun would indeed be quite a cannon. You did. Thanks — and chow! Chow, ciao? Eat and run?